A decade after members of the United Nations Food and Agriculture Organization (UN FAO) approved an international plan to conserve sharks, a new analysis finds that it has yet to be fully implemented. With 30 percent of all shark species now threatened or near threatened with extinction, there is little evidence that the plan has contributed significantly to improved conservation and management of these animals. 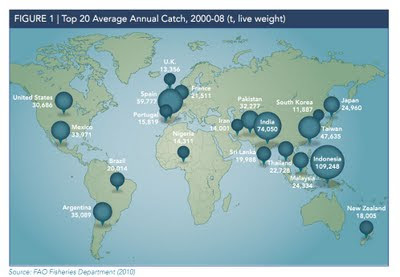 The analysis, The Future of Sharks: A Review of Action and Inaction (PDF), uses fisheries information provided to the UN FAO to identify the top 20 shark-catching countries and other entities, and then assesses whether they have taken the management and conservation measures they agreed to in 2001. According to the review, only 13 of the top 20 have developed national plans of action to protect sharks - one of the primary recommendations from 2001 - and it remains unclear how those plans have been implemented or if they have been effective. The top 20 shark catchers account for more than 640,000 tonnes annually, nearly 80 percent of the total shark catch reported globally. The top 10, in order, are: Indonesia, India, Spain, Taiwan, Argentina, Mexico, Pakistan, United States, Japan, and Malaysia. Indonesia, India, Spain and Taiwan account for more than 35 percent of all sharks taken annually, based on their own reported data. Worldwide, shark populations are in decline due to unregulated fishing, much of it to meet the high demand for fins. Up to 73 million are killed annually primarily for their fins, which are used as an ingredient in shark fin soup, a popular dish in many East Asian countries. The analysis was produced by TRAFFIC, the wildlife trade monitoring network, and the Pew Environment Group.